In case you weren't aware by now, I'm obsessed with skincare -- and I'm even more obsessed with face masks. If one were to rummage through all of the beauty products in my apartment, one might just find, oh, I don't know, over 200 sheet masks and probably 50 or so face masks all over the place. (I told you I was obsessed.) 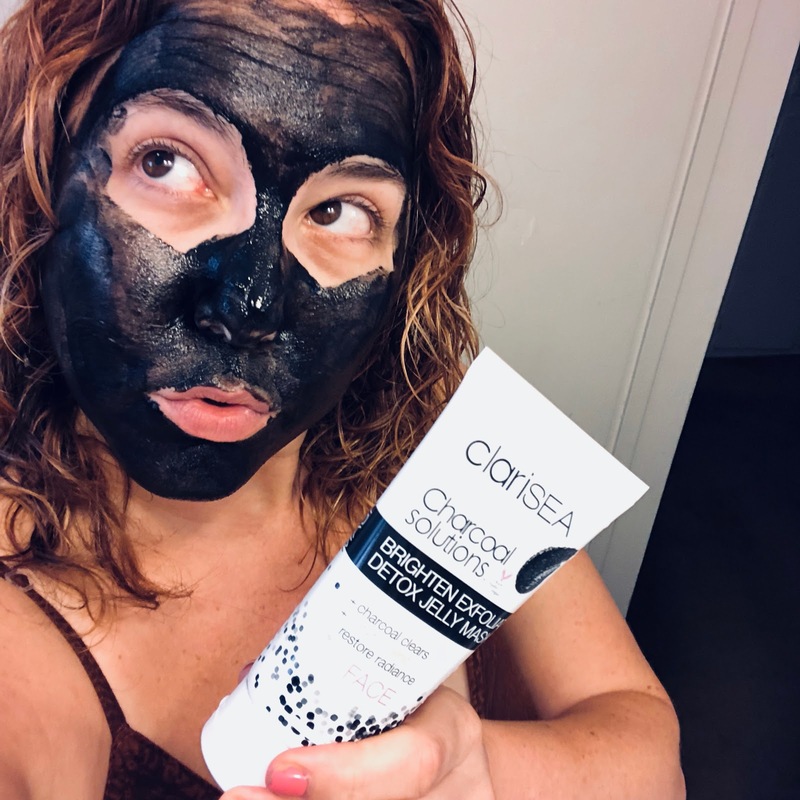 But, recently, the mask that's risen right to the top of the pile is the ClariSEA Charcoal Solutions Brighten Exfoliate Detox Jelly Mask (say that three times fast!). I'm a member of the amazing influencer group, PALM BFFs. The benefits of being a member are seemingly endless -- not only do I get to connect with other likeminded bloggers and influencers in the fashion, beauty and lifestyle community, but I get to discover amazing new brands through the network's Palm Picks program! That's how ClariSEA first came into my life, and wow, am I ever glad it did. This mask is literally everything. It detoxifies, adds radiance and soothes skin in only 5 minutes! Yes, you get visibly clearer skin in the time it takes to cook Minute Rice. (Yes, I love Minute Rice. But I digress.) 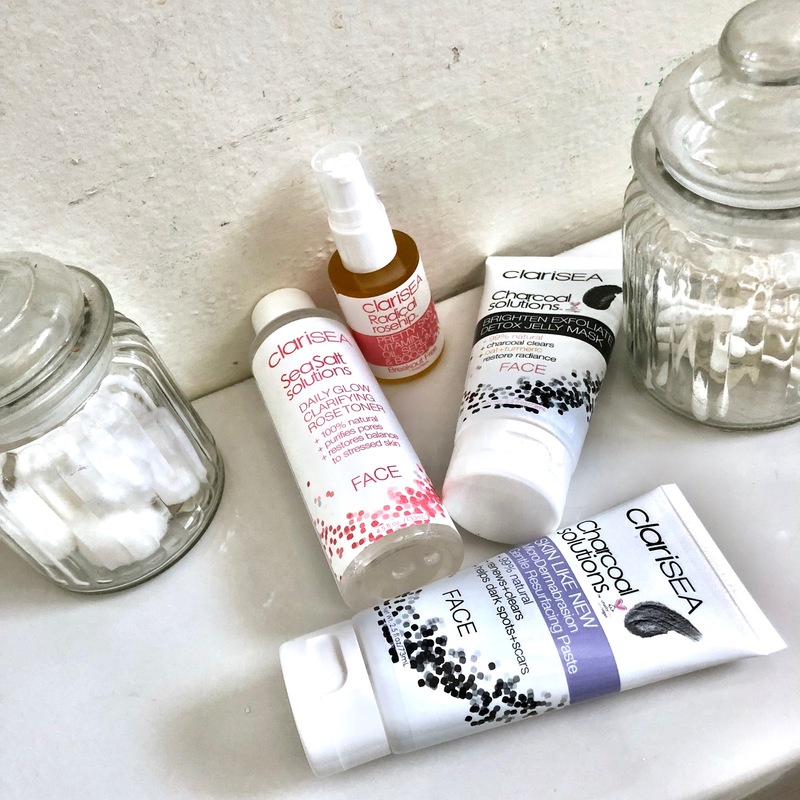 All you do is squeeze a generous amount of the mask out of the tube, massage it in circular motions onto your face (concentrating on the areas that really need a little extra TLC -- in my case, my chin and nose), and wait five minutes before rinsing it off. Since it's black charcoal and I was worried about the mess, I just stepped into the shower after and rinsed it off quickly -- it came off really easily just by holding my face under the spray for a moment. I've had issues in the past with grittier exfoliating masks -- they usually tend to dry out and irritate my skin. (GLAMGLOW is NOT my friend.) But this mask is so different! In this case, I actually love its subtly gritty texture -- but I also love that it doesn't strip my skin as it works and leaves skin feeling super soft, clean and refreshed. I've been suffering from some hormonal breakouts recently and my skin cleared up a ton after only one use -- my breakouts were visibly reduced and way less red. Plus, come on, it looks so cool! ClariSEA is all natural, vegan and cruelty free. I am admittedly not someone who always gravitates towards products with these claims -- not for any real reason except that there are a lot of brands I love who aren't all natural or vegan -- but ClariSEA really delivers. A few more products from the ClariSEA line. That serum is 🔥. Everything from ClariSEA is super affordable, too. This mask is only $14! And right now this and a ton of other items from this brand are on sale at 300 CVS Pharmacy stores in California. This is only happening until 7.28, and all you have to do is visit clarisea.com to find the one closest to you! The sale is happening in stores only, so don't miss out! The ClariSEA Charcoal Solutions Brighten Exfoliate Detox Jelly Mask retails for $14 at clarisea.com. I am obsessed with masks, and skincare in general, and have never tried anything from this brand! Good to know that their products are available at CVS! I will definitely check them out on my next trip there! Charcoal masks are my favorite when it comes to balancing out my oily skin! I think you may have me beat in the quantity of face masks in my house right now. LOL! This one sounds wonderful. I've never heard of the brand before now. Good to know they're both vegan and cruelty-free! I wonder if they'll bring the line to all CVS. It sounds interesting. It sounds like an amazing mask! I wish it was on sale in South Carolina. I absolutely love a good charcoal mask! Charcoal does wonders for my oily, acne-prone skin! It's great to hear that they're cruelty free! I really love Clarisea! I haven’t tried this mask though but now I want to.